Hope you are all having a nice summer (or winter, if you are on the other side of the world from me)! It’s been a bit quieter over here lately and I wanted to touch in. I started this little blog of mine a while back as a way to inspire and educate people around the importance of eating real food. Sadly, I lost my way as the pressure of keeping the blog updated grew to be too much. While things may appear sparkly on the surface, there are times I’ve wanted to throw in the towel or just work on someone else’s dream. The good news is – I’m back! I adore you readers and the community we have created here. You have no idea how much joy I find in being part of your health journey. When you pour your heart out about your daily struggle with digestive issues, weight loss or body image – I totally feel your pain. You then have gone on to tell me your life has transformed after making a few small changes that were mentioned in the blog. It is in these moments when I feel like I’m exactly where I’m supposed to be, doing exactly what I was meant to do. Wherever you are on your journey, I’m here for you. I’m working determinedly behind the scenes to be here for you in a much bigger way… details to follow later this week! In the meantime, I wanted to share with you this refreshing smoothie. 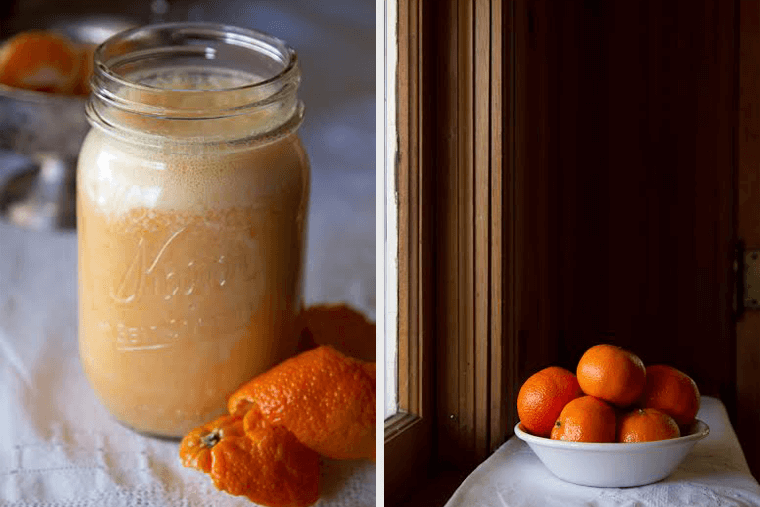 Toss oranges, almond milk, vanilla bean and ice in a blender. Blend until smooth. Place coconut oil in last and blend for additional 10 seconds. *Note – coconut oil may clump depending on temperature of ingredients. Don’t desire clumps? Omit ice, make sure ingredients are at room temperature and use coconut oil that is melted. Pour into large glass and enjoy. As you might have guessed, I LOVE smoothies. Because they’re easy to digest, I always start my day with a gigantic fruit and veggie-packed smoothie. When I’m low on groceries or simply need to use up the random ingredients in my fridge/freezer, I’ll start tossing things in the blender in hopes of coming up with something delicious. That’s how this amazing smoothie was created! The result was surprisingly delicious and the color is stunning! This creamy concoction is packed with all kinds of beauty nutrients. Good skin starts from within and every meal is an opportunity to nourish your skin. Eating plenty of colorful produce is one of the best ways to keep your skin looking clear, firm and radiant. 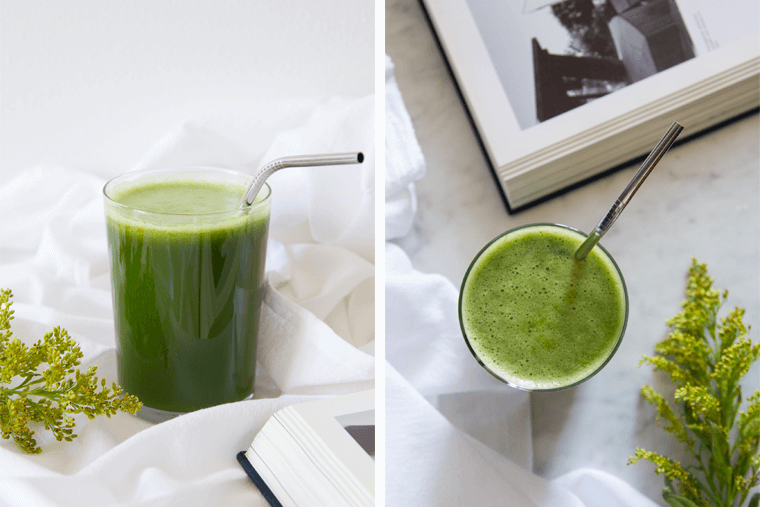 This smoothie is definitely a beauty booster – inside and out. It contains beet which is anti-inflammatory, helps to purify the blood, cleanse the liver and is a good source of iron. You’re also getting plenty of vitamin C, antioxidants, B vitamins, healthy fats and fiber from all the other goodness like avocado, celery, strawberries, cucumber and lemon. 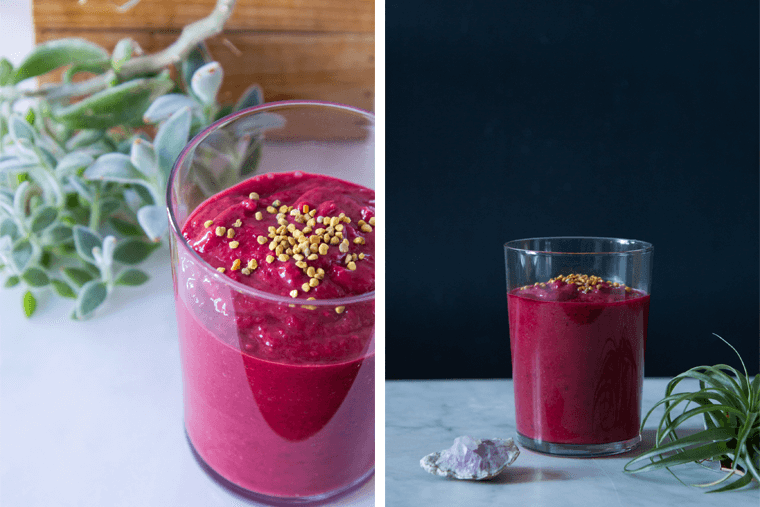 If you really want to kick things up a notch, try sprinkling a teaspoon of bee pollen over the top of the smoothie. Bee pollen is known for its rich and varied nutritional properties – it is high in proteins, amino acids, vitamins and folic acid. Pour into glass and top with bee pollen, if you so desire. You may have noticed things look a little different around here. We received a makeover! A new season and a new direction for the site called for a fresh design. What do you think? I hope you like it as much as I do! A trip to Austin for my birthday. Complete with outdoor music, boating, lots of yummy food and great company. It is such a cool town! Our wedding was on June 21st in Iowa. We shared a very intimate ceremony with our immediate families – just 12 of us in total. It was dreamy. After returning home to NYC, we played tourists while showing my husband’s family all the sights. We went upstate for two nights to relax poolside. Yesterday we went on a day trip to Fire Island for some fun in the sun. I’m still washing sand out of my hair. My juicing game hasn’t been up to scratch lately and last week I was paying the consequences. I spent 4th of July weekend recovering from a cold. I was feeling a little run down from all the traveling we’ve been doing (and all the fun we’ve been having). This juice has been the perfect remedy to mend me back to health. Run all ingredients through a juicer and juice away. Photo credit: my sister, Jenny Norris. You know what, friends? It looks like Spring has finally arrived in NYC! In fact, there have been some pretty hot days here already. One way I combat the heat is with a cold smoothie. This one has been a favorite of mine for a while now. 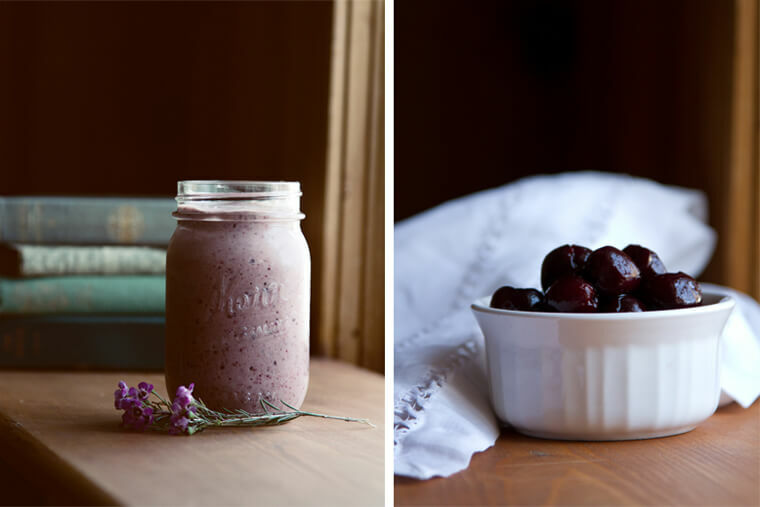 Cherry season is right around the corner, so keep this recipe close when the time hits! Feel free to use frozen cherries until then. Cherries are packed with antioxidants and offer many health benefits. They help support healthy sleep, help lower blood pressure, reduce inflammation in the body and also aid in the recovery of muscles post-workout. You’ll love how creamy, sweet and slightly tart this smoothie is. Kind of makes me want one right now… another one, that is. Toss all ingredients in a high power blender and blend until smooth. Enjoy. Photo credit: My sister, Jenny.